Game Review: 'Bioshock: Infinite' a gorgeous carbon copy | Grand Central Magazine | Your Campus. Your Story. Games that combine story and gameplay seamlessly are rare and something to be treasured. Games in which the gameplay, story, characters, sound and visuals come together creating a whole greater than the sum of its parts needs to be treasured even more so. 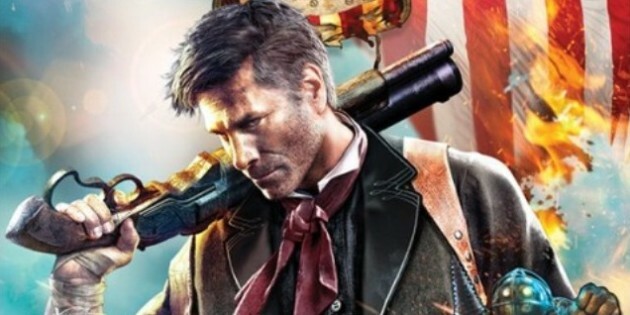 “Bioshock: Infinite,” the successor to “Bioshock,” is one of these games. A canoe in the middle of the ocean, two strangers speaking like they know the player and a box filled with memorabilia to help on the mission. “Bring us the girl, and wipe away the debt,” is all players are told. As Booker DeWitt, gamers must now journey to the floating city of Columbia to rescue Elizabeth. DeWitt is as clueless as the player as to what’s special about Elizabeth, himself or Columbia and its leader, the prophet Comstock. Video games have a nasty habit of painting characters with broad strokes. Far too often characters have no depth beyond the surface, and if they do, the makers handle them clumsily. “Bioshock: Infinite” dodges these pitfalls artfully. The dynamics of Elizabeth and DeWitt’s relationship are real enough to be believable and well written enough to be interesting. Developer Irrational Games handles their characters exceptionally. The game never once tells players to care about Elizabeth. They don’t have to fall in love with her and her innocence, but no one would blame them if they did. In the beginning DeWitt is a rough ex-pinkerton, but by the end some may find him worthy of sympathy, others may find him despicable. The world of “Bioshock: Infinite” is just as well crafted as the characters. The early 1900′s architectural style, old-timey piano jiggs laden with static, the racism subjugating Irish and African Americans to the lower rung of the social ladder and the omnipresent propaganda help transport gamers from the couch and into Columbia. A better made game world doesn’t come to mind. “Bioshock: Infinite” is gorgeous. The bright art style lends a feeling of utopia only for it to be snatched away as DeWitt progresses deeper into its recesses. As the world is destroyed, Columbia develops a sort of morbid beauty, an elegance in its decimation. The original “Bioshock” had the same feeling, but now players can watch it as it falls apart instead of seeing the destruction after the fact. The gameplay is near identical to the original “Bioshock.” DeWitt has upgradeable weapons at the ready to fight enemies ranging from the lowly foot soldier to the gargantuan “Handy Man” (a part robot, part man behemoth). Thanks to “vigors” DeWitt can shoot electricity, fire and six other powers at his enemies, but something has been bothersome about the vigors: no one else has them. There is only one instance in “Bioshock: Infinite” in which another character used vigors against DeWitt. And it’s not like vigors are rare. DeWitt finds them laying around Columbia just waiting to used. Hell, they have vending machines of vigors, which makes it odd, borderline frustrating, when players have an unfair advantage over the enemies. The biggest problem, and it’s a small one at that, with “Bioshock: Infinite” is its similarity to its predecessor. Every single facet of “Bioshock: Infinite” can be found in “Bioshock.” Replace Columbia with Rapture, Comstock with Andrew Ryan and vigors with plasmids and leave a near carbon copy of the original game. It’s as if makers were painting by numbers, but when the resulting product is a Rembrandt, it’s hard to fault Irrational Games for that. Most everything about “Bioshock: Infinite” is top notch. The shooting and gameplay are very good, but the game really shines in its characters and world. It may have come late, but the game of the generation is here. Separator image Posted in Arts & Entertainment and tagged with Arts and Entertainment, biochock: infiniate, bioshock, booker dewitt, columbia, game review, games, Gcmag, Grand Central Magazine, irrational games, Matt Western, Sara Wiseman, Video Games.